Life is better when there is a good Taylor guitar in your life, and for this guitar, at this price, you won’t go wrong. Clearer definition about what control does what. Whether you like it or not, we need big names, heavy-hitters, and recognisable faces. Take sports, for example. When Manchester United fail to make an impression in the Premier League, or the Los Angeles Lakers aren’t riding high in the NBA, the entire league seems to, well, lose something. The world of music is no different. While everybody enjoys finding a little something that nobody else has discovered, you need the Foo Fighters, the Eminems, the Beyonces and the Adeles of this world to make triumphant returns every few years. And, of course, musical instruments are the same. Yes, you need custom builders, budget manufacturers and the unusual brands to come up with unique products, but life is always best, especially in the world of guitars, when companies like Taylor are involved. Under the trusty helm of Bob Taylor and Kurt Listug, Taylor has long been known for innovation, but, as acoustic found out a few months ago, the company’s future plans are to use specialist wood that is cut and produced in responsible ways. Interesting times are clearly ahead for this giant in the acoustic guitar world. Within the bottom of the 214CE-CF is a strap holster that doubles as a jack plug for when you want to go electric. The layered copafera in which the holster sits is where the CF designation comes from, and this makes up a bulk of Taylor’s relaunched range of 200 Deluxe models. The wood is matched on the back, and here is where you can appreciate its true beauty. 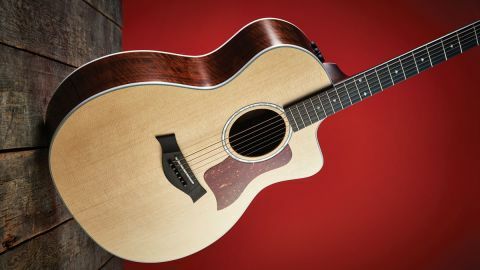 Following cites restrictions on rosewood, the American company announced that the 200 series of Taylors would feature copafera, instead of the previous rosewood. Copafera is a layered texture of African wood, including a middle core of poplar, which helps keep costs affordable and the guitar durable. Aside from it being a great decision for business and the environment, it looks superb: the rich, coffee-chocolate look shimmers with figure in light. There is a Venetian cutaway that creates a divine look, while allowing great access to easy playing up to 14 frets, though you can reach further up to 20 should you decide to play some lead lines in an acoustic group, a setting which would suit this model quite well. Back on the top, the sitka spruce pops from the moment you open the hard guitar case. A well-shaped tortoise pickguard sits on the glossed wood, and joins a single ring around the soundhole that boasts a jewelled effect. The bridge has a sleek, curved design where six black pins hold the strings in place. The strings shoot up over the top of a micarta saddle toward the head, but in-between the saddle and the pins are three small sensors that act as the catalyst for Taylor’s revamped Expression System 2.
up to the head. The fretboard is made from West African ebony. It features 20 frets with diamond-shaped inlays on three, five, seven, nine, 12, 15 and 17. The elixir Phosphor Bronze Light strings stretch over the Tusq nut and past the scarf neck joint to the respective tuners, which are finished in satin. Taylor’s Colorcore logo stands out on the headstock, a clear marque that is a welcome sight to guitar fans. At 11.7cm, the depth of the body on this Deluxe Taylor looks slightly at when you first take it out of the hardshell case, but don’t let that put you off. The grand auditorium size is Taylor’s most popular for a reason, and there is no missing the low end on a hearty E major. But when Bob Taylor developed the shape in the early 1990s, he intended for it to offer the perfect midrange sound for singer-songwriters, while also featuring some nice treble when you pluck the higher strings. Spoiler alert: all of the above is still there. If anything, you appreciate the shallow depth as it allows you to get the guitar closer to your body for a greater look at the neck and body when you’re learning and writing additions to your repertoire. In terms of hearing the difference between copafera and a typical rosewood, there was none. A better trained ear in a scientific scenario where the two guitars were next to each other may have felt the new wood layers are slightly sharper than a original warmer rosewood, but if you’re picking up a guitar for the first time with no knowledge of the change, it is unlikely you would be put off by what you’re hearing. It picks out individual notes well, even when played among a series of chords. An occasional use of power chords among open finger style does not give any depreciation in quality. Elixir’s Lights made playing this 200 series model suitable for our style. We even became inspired enough to write some new material, which doesn’t happen all that often when you hit your peak in creativity some 15 years ago. When plugged in to an amplifier, the new-feel Expression System did its job. The sensors are able to pick up on the strings’ fuller range of movement thanks to their position behind the saddle. We fiddled with the three volume and tone controls, with the best results coming from the left nob in dead centre and the other two slightly past the centre point. One preference would be to have numbers and a descriptor for each control: it’s easy enough to know what the volume is, but it would also be good to have a feel for what you’re changing when you’re changing it. There isn’t a lot about Taylor’s re-up on the 214 that we don’t like. Its looks are to die for, it’s easy to play and the sound is among the best we’ve heard - unplugged or electric. As a new version in the 200 range, it’s a privilege to have been one of the first to play this Venetian cutaway model in the UK. We’ll struggle to give it back, and we’d highly recommend those who work their guitars hard to invest in one. Every guitar collection is made better with a Taylor, but your Taylor collection would be bettered with the 214CE-CF DLX.